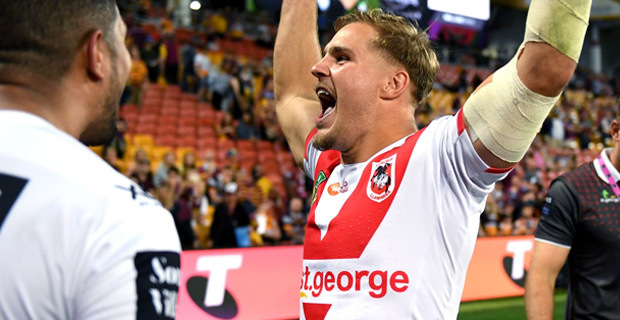 Injured Dragons forward Jack de Belin has rated himself more than a 50 per cent chance of playing in this weekend’s showdown against the Rabbitohs. De Belin, who came into the match against the Broncos last night under an injury cloud with an ankle problem, failed to finish the match after aggravating it in the second half. The Dragons will be sweating on his fitness given they have already lost skipper Gareth Widdop to a dislocated shoulder, while prop James Graham is expected to be given the green light to return from a concussion. The Dragons will play the Rabbitohs at 9.40pm Saturday while the Sharks will play the Panthers at 9.40pm Friday. The winners of these two matches will qualify for the Preliminary Finals next week. Melbourne Storm and the Roosters have already qualified for the Preliminary Finals.